Summary: The Center for Organic Photonics and Electronics Research (OPERA) at Kyushu University has successfully developed third generation light-emitting materials for use in organic light emitting diodes (OLEDs). These materials have a unique molecular design that reduces the energy gap between triplet and singlet excited states, providing a novel efficient exciton formation mechanism, i.e., thermally activated delayed fluorescence (TADF). In these systems, TADF allows a light emission efficiency of nearly 100% from the almost complete conversion of electrons into photons under electrical excitation. First generation organic fluorescent materials and second generation phosphorescent materials are widely used in OLEDs, but the former are limited by low efficiency and the latter by expense. The freedom of molecular design led to the production of an ultimate emitter that realizes both high efficiency and low cost without using rare metals. We call this new luminescence concept “hyperfluorescence”. The results of this research have been published in the online version of "Nature" on the 13th of December, 2012. Although typical organic molecules only contain carbon, hydrogen, nitrogen and oxygen atoms, the unique bonding of carbon involving sp3, sp2 and sp hybrid orbitals enables generation of very complicated molecular architectures that have extensive functions in a wide variety of organisms and industrial products. In the last two decades, the allure of the unlimited freedom of design of organic molecules has shifted a significant proportion of electronics research from inorganic to organic materials. In particular, great advances have been achieved in organic light-emitting diodes (OLEDs). First-generation OLEDs containing fluorescent molecules have progressed to second-generation ones using phosphorescent molecules because their efficient luminescence makes them attractive for use in practical electronics. Herein, a series of new organic electroluminescent (EL) molecules, carbazolyldicyanobenzenes (CDCBs), which do not contain precious metals, is presented. 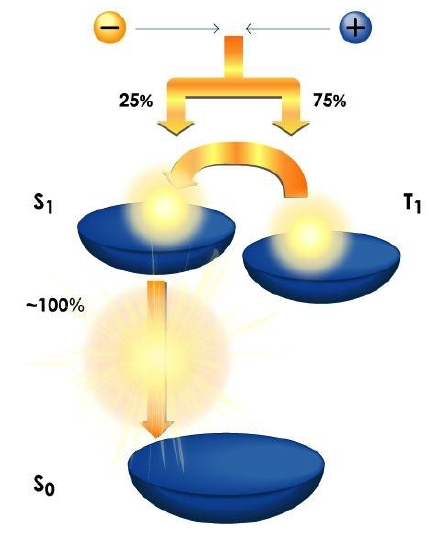 The energy gap between the singlet (S1) and triplet (T1) excited states, delta EST, in CDCBs is minimized through strategic design, promoting highly efficient spin up-conversion from T1 to S1 states while maintaining a high radiative decay rate of >10^6/s, leading to a high fluorescence efficiency of >90%. Using these unique molecules, a very high external EL efficiency of >19% is realized, which is comparable to those of high-efficiency phosphorescence-based OLEDs. These molecules harvest both singlet and triplet excitons for light emission through fluorescence decay channels. From a photophysical viewpoint, it was believed that high photoluminescence efficiency was incompatible with small delta E_ST because of the separation of the highest occupied and lowest unoccupied molecular orbitals, as such separation usually leads to small radiative decay rates. However, the original molecular design of CDCBs achieved a breakthrough on this front. CDCBs are unprecedented EL materials that realize ultimate EL efficiency through an upconversion mechanism. Although phosphorescence from materials such as iridium phenylpyridine derivatives has previously been assumed the sole solution to obtain ultimate EL efficiency, our results clearly provide a new way to attain high efficiency simply by combining common aromatic moieties in suitable configurations. The results presented here confirm that finely tuned molecular design can produce materials with unexpected functions, and reminds us of the great flexibility of organic molecules. It is anticipated that these novel molecules will contribute to the future of solid-state lighting and displays.